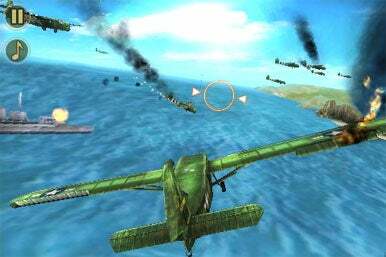 The Brothers in Arms series of World War II combat simulators have stood out on other platforms including the Wii, Xbox, Playstation, and PC for their focus on strategy, realistic combat, and ability to immerse the player into a larger narrative. 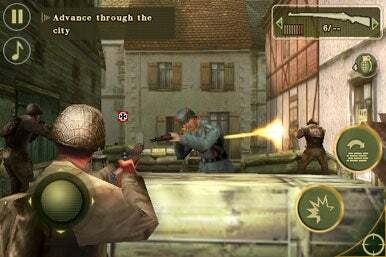 Gameloft, which has already enjoyed a string of best-selling combat games, is seeking to further establish its reputation in the iPhone and iPod touch market with Brothers in Arms II. Gameloft should put you in combat boots in the coming weeks for a likely launch price of $7. I sat down with Elvin Gee, Gameloft’s public relations manager, to get a firsthand at this GI-approved title. The first thing I noticed was how fully realized the game seems to be. I’ve often been frustrated by the one-dimensional nature of Gameloft combat offerings such as Modern Combat: Sandstorm and Terminator Salvation, but BiAII’s is much more immersive and complete. The action gets up close and personal in Brothers in Arms II, coming soon to the iPhone and iPod touch. During the cut scenes, the camera cinematically shifts between first and third person view—an ability you also have in game. You’ll be able to toss grenades, snipe with a scope, take cover, and even sprint to avoid fire. In the game’s tutorial, my character was about to be executed by some Japanese soldiers when a buddy sniped my would-be killers. The camera then shifted from first person to third, and the mission began. Another mission has you hop into a tank and take on German half-tracks and panzer tanks as you assault a Nazi base. While there’s plenty of running and shooting in Brothers in Arms II, Gameloft seems to be paying greater attention to the overall experience. There’s a cover system, more varied missions, and Allied artificial intelligence—in short, you feel like you’re part of the action. More cinematic and smoother transitions between missions hopefully will lead to a more cohesive experience, but so will more content. Gee informed me that Brothers in Arms II will feature nine weapons—including rifles, machine guns, and many other authentic firearms from the era. The iPhone game will feature five campaigns, with theaters of war ranging from the Pacific to the European and back, with different tasks and characters in each. If the game looks vastly different than the previous version of Brothers in Arms for the iPhone, it’s because Gameloft built it from the ground up and used completely new code. The improved graphics are noticeable—the backgrounds are much more detailed than previous Gameloft shooters and the vehicles, bunkers, and explosions are all impressively rendered on the iPhone’s screen. Gee claims that Gameloft have improved its voice acting and writing for this title, though I didn’t see any evidence of that during my demo. Hopefully the dialogue and writing will be improved over Modern Combat, a game that was apparently written by Gameloft’s French development office as a cruel joke on American action flicks. The theaters of combat in Brothers in Arms II range from Europe to the Pacific. As you progress in Brothers in Arms II’s seven-hour plus single player campaign, saves will be performed on a checkpoint system. While some players may groan at having to replay especially difficult segments of mission until they pass, others will welcome not having to save the game every few moments for fear of getting a phone call or having to exit the game for some reason. Gameloft is also working on a multiplayer component that will allow you and up to five others to compete head to head as either Allies or Axis soldiers in battle for control in four theaters of war. Though no launch date has been set for Brothers in Arms II, WWII enthusiasts and combat simulator fans should be looking for the title in the app store in the coming weeks.